Candlelight Remembrance Run - greystonesacs jimdo page! In June of this year Niall Patrick, the 18 yr old son of Greystones AC athlete Jackie, tragically lost his life. Jackie has been a popular and enthusiastic club member for several years and has represented both Greystones AC & Slí Cualann AC on many occasions. Niall, who was a great sportsman himself, was very proud of his mum’s running achievements and always gave her his full support. 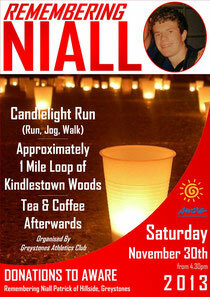 In remembrance of Niall and in support of Jackie, Peter, Conor & Ciara, Greystones AC is organising a Candlelight Run on Sat. 30th Nov. This event will take place in Kindlestown Wood and will be around a loop of approx. 1 mile. We will begin at dusk, around 4.30pm and participants can run, jog or walk as many loops as they wish. Refreshments will be provided afterwards. Donations to AWARE will be accepted on the night, but your presence and support is far more important! Hoping to see lots & lots of athletes, parents, siblings, relatives & friends on the night. Directions from Greystones: Go through Delgany and take the right turn at The Delgany Inn. Straight up this road for approx 2.5K and the entrance to the woods is on your right. As parking is limited, the Lawless family, who live across the road, are kindly providing extra parking in their yard. We will have signs!